I love vintage things. I think it is the romantic in me. The old version of things looks so much better than new things. One day Mr. CH said something annoying. I mean I was really annoyed. Honestly I don’t even remember what he said; I just remember my response. I said (I might have yelled it.) “Don’t you understand that my goal is to get rid of everything plastic in my life?” As soon as I said it I realized how overly dramatic it sounded. I think I laughed at myself for a solid ten minutes. I mean really, as much as I dislike plastic, it’s in everything, except super old stuff like this vintage scale. It has NO PLASTIC anywhere on it. It’s very old and European. I found it at Round Top, which is where I find all of my favorite things. I wasn’t sure what to put in here, so I filled it with dried rose petals. Anything natural and/or old I think would work. The dried rose petals add some nice color. If you are wondering where you can find your own antique scales, I would start with eBay. If you go to antique shops and resale shops, it will be hit or miss. They might have it, or they might not. Even though vintage scales are difficult to find, I think they are well worth it. I mean you can put anything in them, and they are super interesting even with nothing in them. 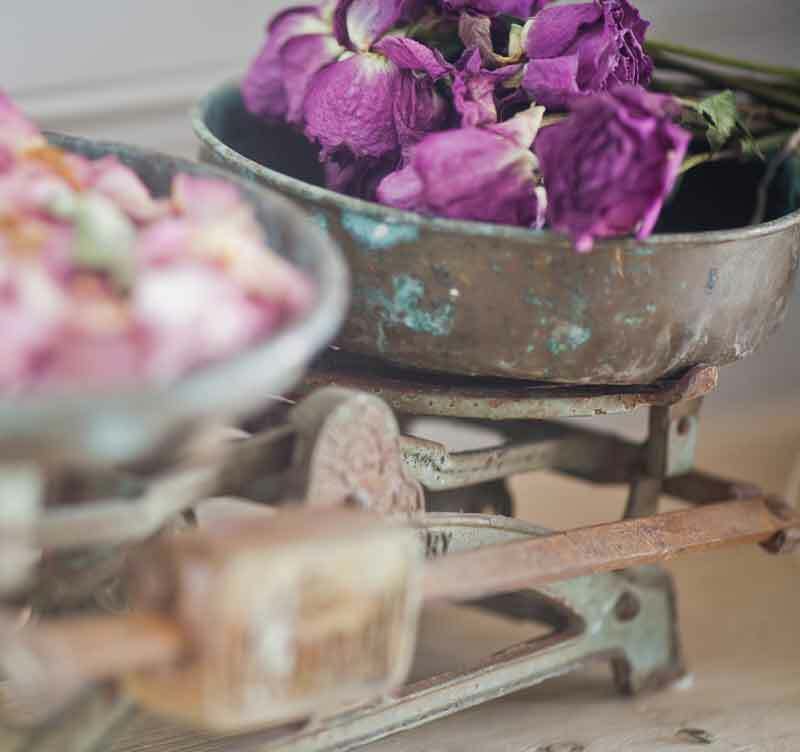 I used dried roses in mine, but you could put most anything small in them. I think I know what you mean by wanting to get rid of all the plastic in favor of items that are not ‘disposable’ as plastic. 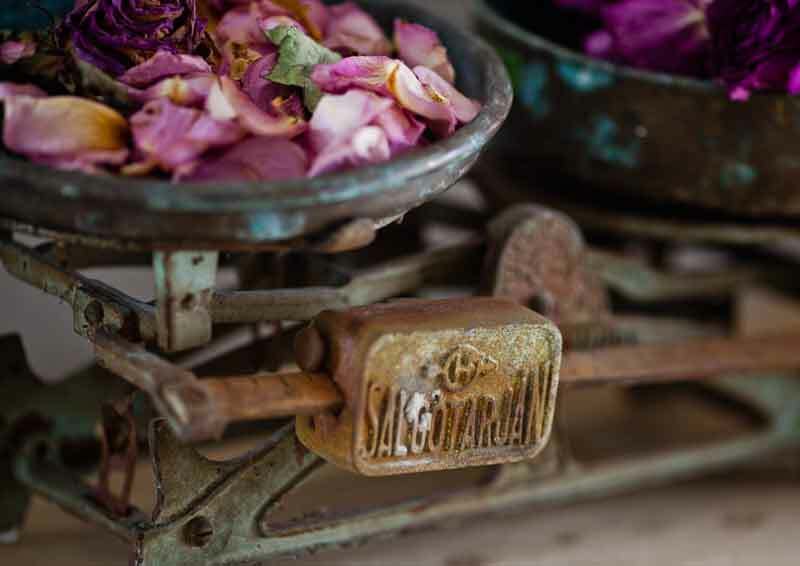 The scale and other vintage items like it are like little sculptural pieces of history that take us back to a time when people took time to write artfully and beautifully written letters, make brewed tea and home-made dinners. 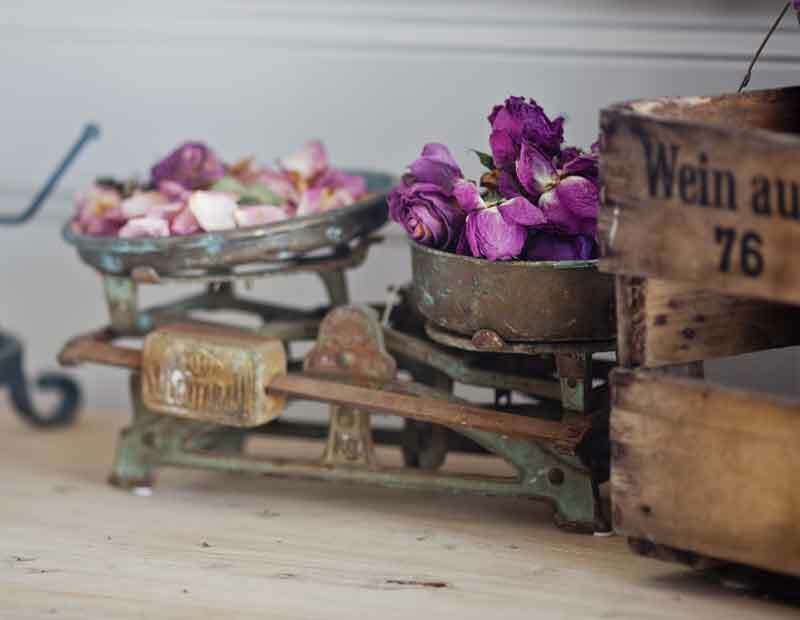 These items have lived a whole life and have history to it and so a certain kind of ‘warmth’, so when we decorate with vintage, we are decorating with history. Thank you for the beautiful photography that really brings out the warmth of the scale! I know what you mean about getting rid of plastic!! I have been a collector of vintage items for years!!! I I find your blog so creative with how you repurpose theses items? You talk of Round Rock so often.I would like to go there…is there any particular place in Round Top? It’s all good. There are many places on 237 that you will love. We have a similar scale that we found in a London street market many years ago. My husband hand carried it on the plane back to our home in Virginia. 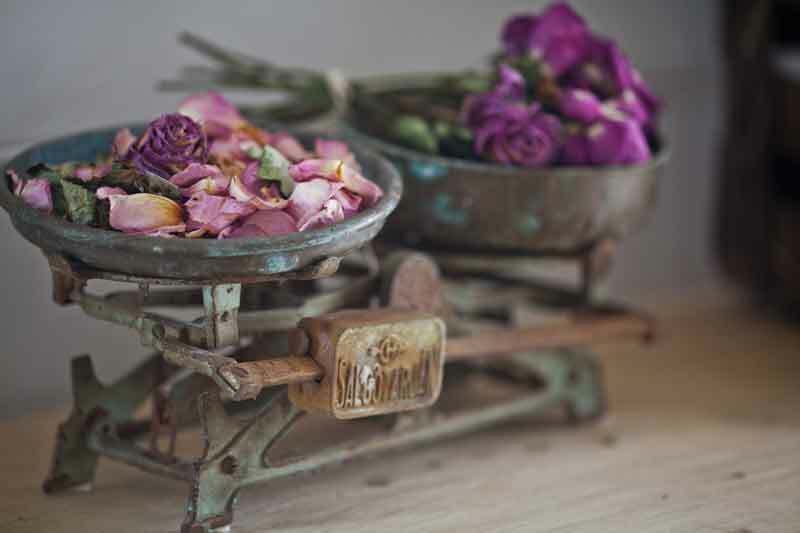 I love the idea of putting dried flowers and petals in the bowls and think I’ll do that with ours. Thanks for sharing! Wish I could get rid of all plastic, too. What a cool way to beautify an old piece! Truly a work of art! I bought an old scale recently at a garage sale. It’s still sitting in my garage though. I think you just motivated me to set it on my island with a potted plant on one side of the scale. Now, what to balance the other? What a timely post, Anita. ohhhhh…please don’t ever yell at your husband. He puts up with your obsessions and loves you even if he disagrees and lives with stuff HE doesn’t love. Well I don’t think I really yelled. We are both pretty mellow. Anita have you ever met the Junk Gypsies? I love how they redo vintage not my decorating style but love to watch. I love your style that’s me. Again, I love your blog. I haven’t met them, although our farm isn’t far from their new shop. I was thinking how cute the scale would be in a bathroom with little soaps or rolled up washclothes. I never have room for all the neat things I would love to have. Probably a good thing!